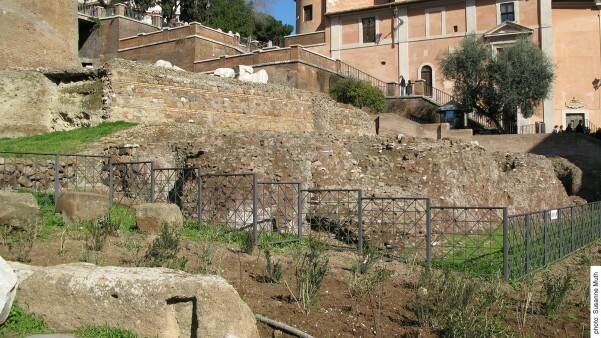 The inconspicuous remains of the Temple of Concord, which are still visible at the western boundary of the present-day excavation site, do not bear testimony to the magnificent appearance of the original building, which once dominated the west side of the Forum. The impressive architecture of the temple reflected the ideological message of the cult: This is where Concordia was worshipped, the goddess of harmony – and this concept of harmony especially focused on the political harmony between citizens as the presupposition and guarantor of the well-being of the Roman state. It is no coincidence that the Temple of Concord was located directly next to the places of political decision making at the Forum (the Curia and the Comitium with the Rostra). There it represented the ideal of harmony as a virtue of political action. When one considers how often this harmony between the citizens was under threat, it does not come as a surprise that this temple was frequently exploited in order to evoke the notion of political harmony. So it served as the venue for controversial and important debates of the Senate – e.g. about the Catiline Conspiracy. In general it seems that the time periods at which the temple was constructed and then substantially modified coincide with time periods in which encouraging peaceful conduct for the good of the state was of central importance. 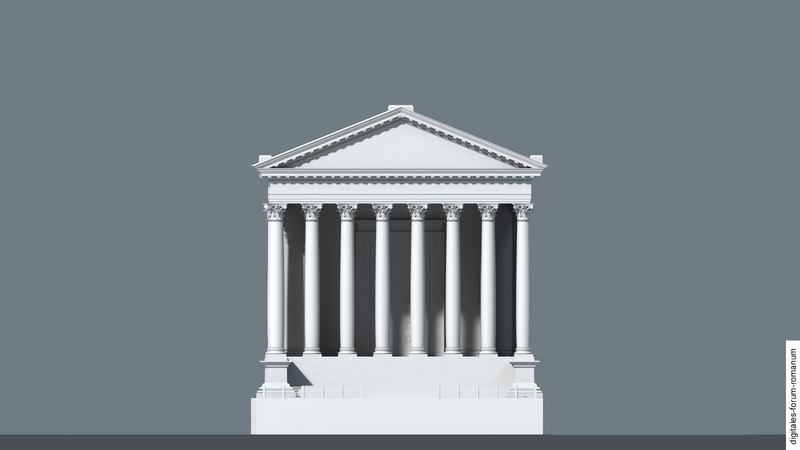 How strongly Concordia, whom the temple was dedicated to, was meant to represent the political harmony of Rome’s citizenry, becomes evident when one looks at the temple’s genesis. The founding of the cult and probably also the erection of the first temple structure can be traced back to the middle of the 4th century B.C. ; or more precisely: to the time around 367/66 B.C., when the longstanding Conflict of the Orders, which was carried out between the patricians (“aristocracy”) and the plebeians (“the people”), came to an end. Literary sources that originated from a later period provide us with the following story: In order to attain the new harmony between patricians and plebeians, the legendary dictator Camillus pledged to build a temple for Concordia in 367 B.C., whereupon the citizens of Rome reconciled with one another and consented to the construction of the temple. Within the scholarly debate it is contested whether such a temple was actually built at the time. One view holds that only a small shrine was erected for Concordia in 305 B.C. and not an entire temple (however, this seems pretty implausible in light of the historical context of the Forum’s development; see below). One episode of the temple’s history where the evidence is conclusive is its rebuilding in 121 B.C. on the behest of consul L. Opimius, after his victory over C. Gracchus and his followers in the civil strife between the Optimates (majority of the senators) and the Populares (the people). 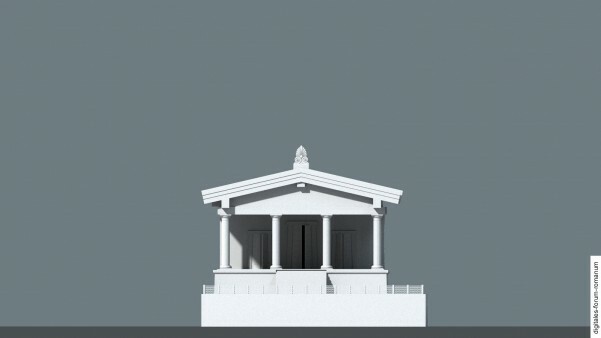 Whereas the first temple (at the middle of the Republican Period) served to conjure up the hopeful spirit of a regained political harmony among the citizens, the Temple of Concord – as constructed by Opimius – took on a whole new dimension: As an “aggressive” victory monument it was meant to symbolise the subjugation of the Populares and a state of harmony that was imposed through the force of arms. Thus, its primary function consisted in sending a message of warning to the Populares, advising them not to act against the interests of the Senate. 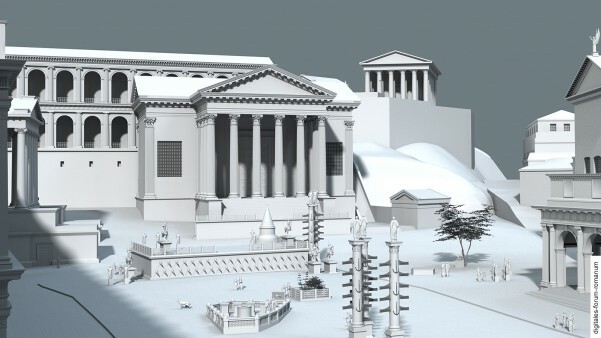 Concordia, who was worshipped in the temple, was presented in yet another light, when the temple of Opimius from the late Republic was torn down under Augustus and replaced with a new structure. Most probably Tiberius began to rebuild the temple in 7 B.C. and inaugurated it in 10 A.D. From that time on Concordia Augusta was worshipped there, symbolising the kind of concord that was achieved by the new Princeps Augustus by overcoming all of the problems of previous civil wars and was now said to be guaranteed under his rule. Here again Concordia was transformed into a hopeful vision of political harmony among the citizens of Rome under the new rule of Augustus and his family. The history of the temple during the subsequent Imperial Period gives us no evidence of further restoration measures. Only traces at the interior of the cella indicate smaller kinds of restoration procedures during the Severan period. The structure most probably survived in its Augustan guise until Late Antiquity. However, at some time during the 4th or 5th century A.D. the old structure must have been rebuilt or restored, as a dedicatory inscription of the temple (which was once found and is now lost) dating back to Late Antiquity informs us (for the individual phases, see below). Both the temple of Opimius from the late Republic as well as the Augustan temple of Tiberius had a towering and richly decorated architecture so that the temple dominated the west side of the Forum. 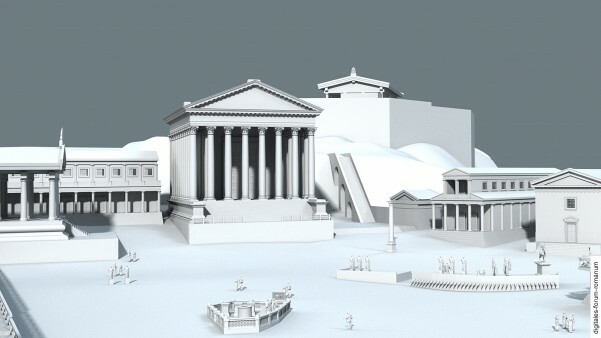 Nearly everything of this architecture has been destroyed – only the core of the foundation, composed of opus caementicium, which belonged to the Augustan temple, as well as a small number of structural fragments have been preserved and allow us to come up with a fairly accurate reconstruction of the Augustan temple. Within the core of the Augustan temple, consisting of caementicium, some remains of the foundations of Opimius’ temple have survived. To what extent the remains of the temple from the middle of the Republic have been preserved in this way continues to be a controversial issue. The upper architecture of the temple that was present in the middle and late Republic can only be approximately reconstructed by comparing it to similar contemporary buildings (for images of the ruin at the present day, see below). Whether or not a temple for Concordia was erected around the middle of the 4th century B.C. remains an open question within the scholarly debate. A writer from the Imperial Period connects the structure to the legendary dictator Camillus, who pledged to build the temple, if the Conflict of the Orders, which had raged between the patricians and the plebeians, was to end. The Conflict of the Orders was settled by passing the Lex Licinia Sextia in 366 B.C., which led to the creation of a new kind of aristocracy, the nobility, which was comprised of both patricians and plebeians, who were supposed to govern Rome together from then on. If one believes the literary sources (which emerged long afterwards), then the erection of the Temple of Concord has to be assimilated to this date. However, classical scholars have long since demonstrated that Camillus is a fictitious figure, which was created much later, so that all of the literary reports about him have to be called into question. The same doubt applies to the supposed Temple of Concord that Camillus pledged to build. 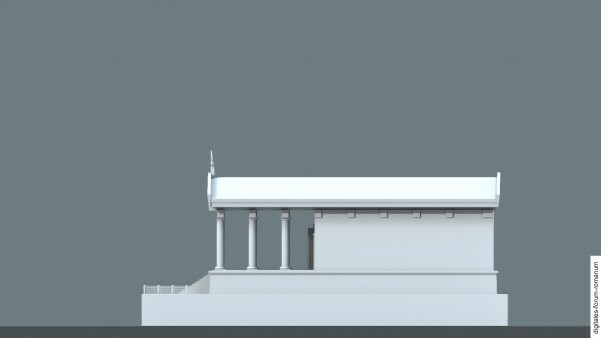 Thus, some scholars have argued that the cult of Concordia, which was situated at the west side of the Forum, was not founded in 367 B.C., but in 305 B.C., when a small shrine was erected for the goddess. According to this view the first big temple for Concordia was only built during the late Republic. 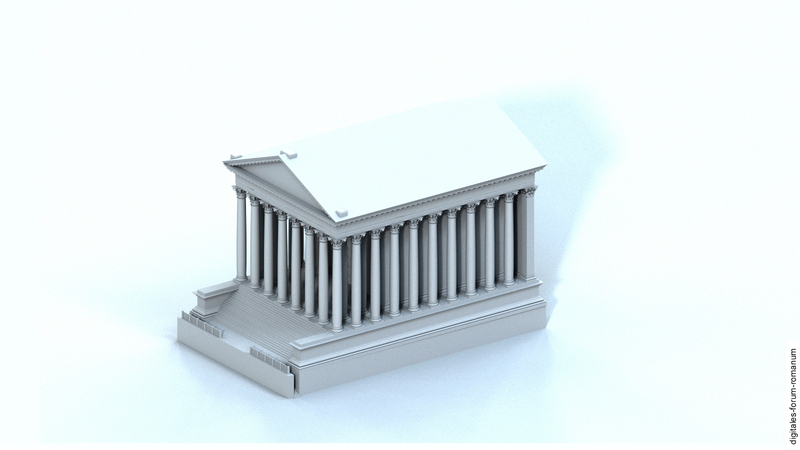 All in all it seems more likely that some sort of temple was already built around the middle of the 4th century B.C. Doubts concerning the figure of Camillus only affect the credibility of his personal history and the supposed fact that he initiated the construction of this temple in 367 B.C. However, this in no way implies that no temple for Concordia existed around the middle of the 4th century B.C. It is certainly imaginable within the context of the Conflict of the Orders that such a Temple of Concord was indeed erected, but then later wrongly tied to the legendary figure of Camillus, which led to the story that can be extracted from the literary sources. From a historical perspective the founding of such a cult and temple makes much more sense at the middle (as opposed to the end) of the 4th century B.C. Furthermore, if one supposes that a small shrine was built for Concordia instead of a large temple, then it is extremely difficult to explain, why a monumental temple was first built on this area in the later stages of the 2nd century B.C. This becomes even more problematic, if one considers that in the early stages of the 2nd century B.C. 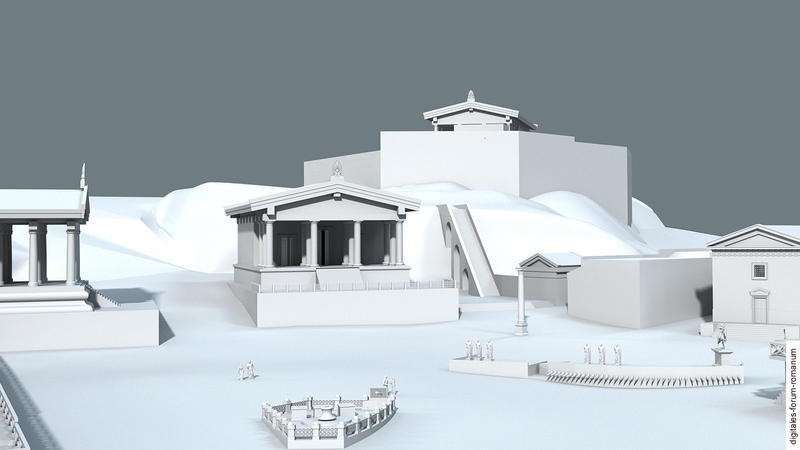 representational structures were erected on all of the free spaces on the Forum – a process that was propelled by the rivalling political factions. The fact that Opimius erected an impressive temple makes it very likely that an actual temple was already located in this area. 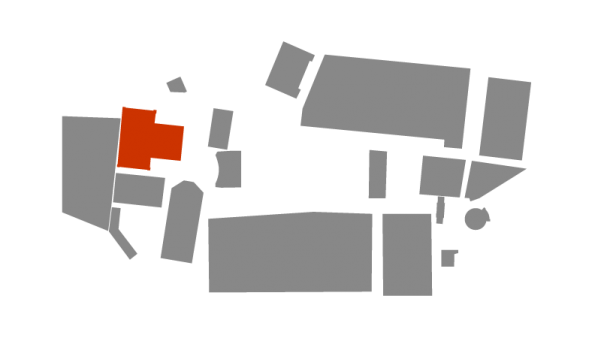 Furthermore, remains of walls have been found in the foundations of the later temple that suggest that a bigger structure once stood here in the 4th century B.C. 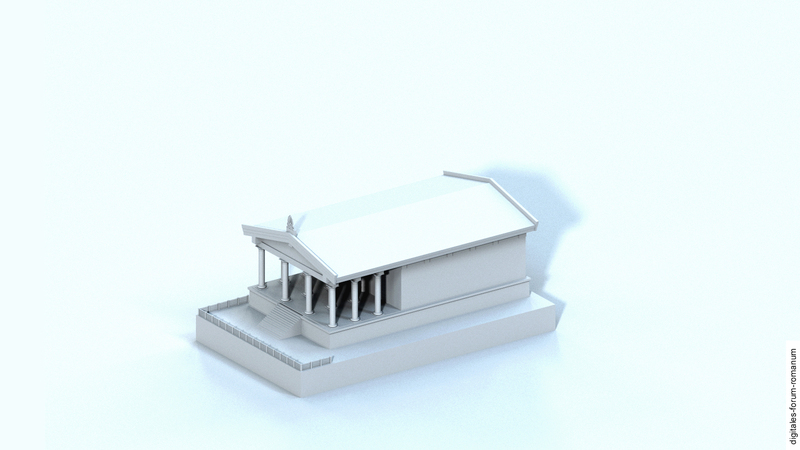 Accordingly, we have chosen a large temple for our reconstruction for the 4th century B.C. The positioning and the scale in the layout closely mirror the overall arrangement of the successor structures. We have reconstructed the upper architecture by comparing it to other similar contemporary temples. This has resulted in an architectural form of the temple that still resembles the appearance of the old and compact temples in the Etruscan style. The newly constructed temple of the consul L. Opimius contrasted with the supposed first temple from the middle Republic in a very distinctive way. After the civil strife between the Optimates and the Populares, which had arisen under the Gracchi in the late 2nd century B.C., was brought to an end and C. Gracchus and his followers were defeated, Opimius ordered the Temple of Concord to be rebuilt. In line with the overall restoration measures that were carried out on the Forum during the 2nd century B.C., the temple was built on a monumental scale and rose above the Comitium with its towering and magnificent architecture. 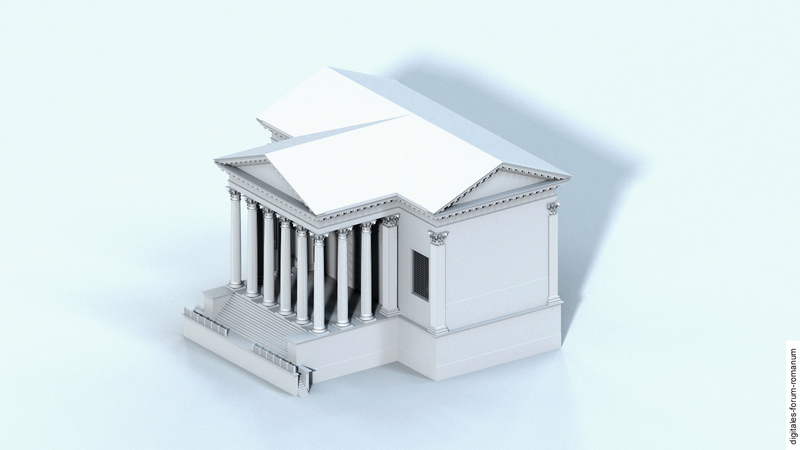 The temple’s exterior was modelled around the modern temple architecture in the Hellenistic style, which was popular in Rome at the time – a similar process is observable at the Temple of the Dioscuri, which was erected at the south-east corner of the Forum several years later. 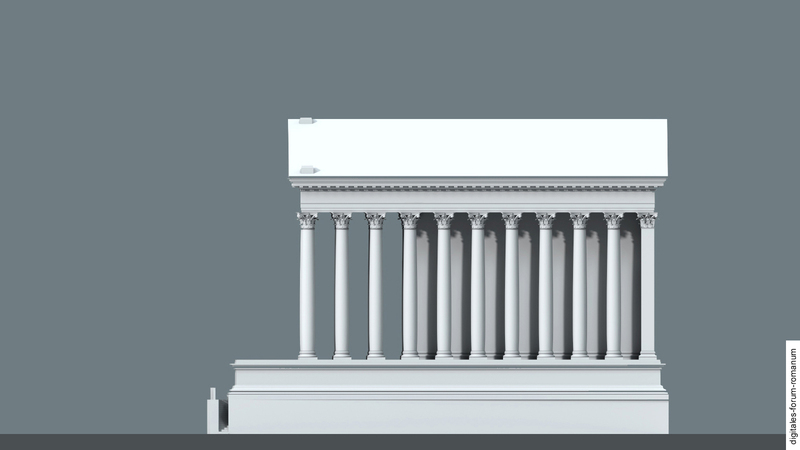 The temple had pillars on all sides, except for the back where there were none (“Peripteros sine postico”). 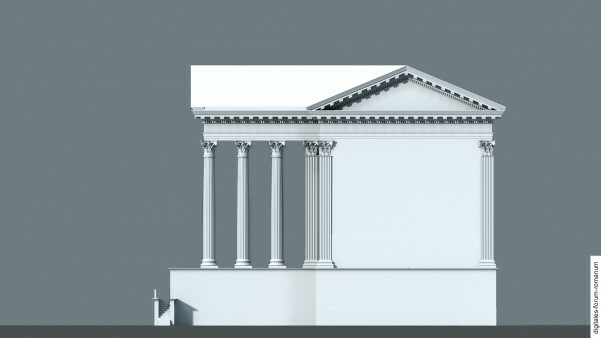 8 pillars adorned the front. 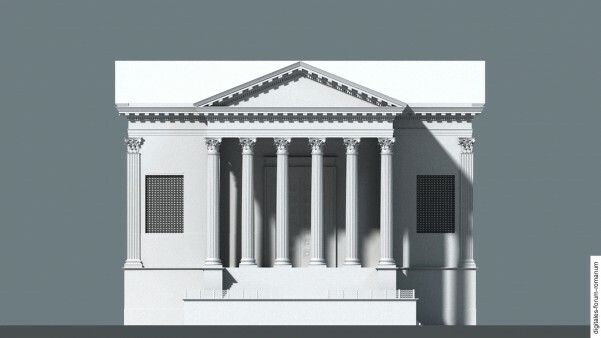 While the Augustan construction of the Temple of the Dioscuri (dating back to the Late Republic) at the south-east corner of the Forum retained the outer appearance of the preceding structure, exactly the opposite happened in the case of the Temple of Concord: The construction of the Temple of Concord under Augustus led to an entirely transformed physiognomy. Instead of a long cella (main chamber of a temple), which was orientated along an east-west-axis (as the temple of Opimius had been), the Augustan temple took on a special kind of architectural format with its transverse cella. As against the temple which Opimius had built, the pronaos of the Augustan temple was reduced at the sides and its front was adorned with six pillars; the transverse cella, however, jutted out noticeably on both sides over the area of the predecessor structure (the extension of the Augustan cella to the north and to the south probably necessitated the demolition of the Basilica Opimia, which stood next to Opimius’ Temple of Concord). Thus, the Augustan temple was able to dominate through its monumental architecture and this seemed to constitute a better reaction to the cramped surroundings (the construction area was comparably short due to the adjacent Tabularium on the west side and the road that ran in front of the temple on the east side). A further reaction to the cramped spatial conditions becomes evident, when one looks at the temple’s steps. These do not lead one up to the temple by walking up a continuous set of steps on the front side, but by walking up stairs at the side of the temple that ascend to the lower area. Literary sources and depictions on coins both indicate that the temple was richly decorated with statues; especially the cella seems to have been a popular site in this respect.